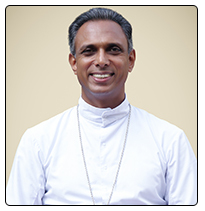 Father Joseph Kodkallil was born on 18, Dec 1965 in Upputhode (India), Eparchy of Kothamangalam. He joined the minor seminary in Satna and did his philosophy at St. Albert’s College, Ranchi and theology at St. Thomas Apostolic Seminary, Vadavathoor. He was ordained a priest on 31 December 1991. Later he pursued his studies in Rome and earned a doctorate in liturgy at the Pontifical Oriental Institute. He is fluent in Hindi, English, Italian and Malayalam. Father Kodakallil has served as parish priest of Rewa and Vadavathoor, Rector of St. Thomas Minor Seminary in Satna, professor and vice-rector of St. Ephrem’s Theological College in Satna and Vicar General of the said Eparchy. The See was vacant from 27 August 2014 after the retirement of Bishop Mathew Vaniakizhakkel. He was ordained bishop on 15 September 2015.